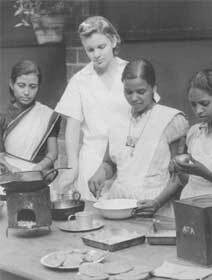 The Agricultural Institute was established under the leadership of Dr. Sam Higginbottom, in 1910, as an ecumenical Institution of the Christian Churches and Church organizations in India. Dr. Sam Higginbottom came to India in 1903 and joined the North India Mission of the Presbyterian Church. From 1903 to 1909, he taught economics and science in the Allahabad Christian College, presently known as Ewing Christian College, and at the same time studied the local dialect. During this period, he became a familiar figure in the surrounding villages. He also saw and observed the living conditions of the villagers and was deeply concerned about the ancient system of agriculture that contributed to low productivity and thus led to extreme poverty amongst them. He was also genuinely disturbed by the vast gulf between the urban Christian and the rural masses. For several months he contemplated upon the Christian neglect of the villages and ultimately by the end of 1909 he decided to bridge this gulf by establishing an agricultural school, which he envisioned would educate the village boys, introduce improved agricultural methods and cooperate with the local farmers in solving their practical agriculture related problems. He also took over the responsibility of supervising a home for lepers. This home was operated by the Allahabad Charitable Association,but since the home did not have adequate facilities for providing food, clothing and shelter, the lepers often left and wandered into the city as beggars. Dr. Higginbottom himself found them repulsive as most of them had lost their fingers and toes, their wounds were wrapped in dung coloured rags. Dr. Sam Higginbottom was so disturbed by the sight that within a few weeks he asked to be relieved of this responsibility, but Mr. Arthur Henry Ewing, the Principal of Allahabad Christian College, encouraged him to continue this work. Realizing that his attitude was inconsistent with the teachings of the Bible, which taught to cleanse lepers, the young missionary acknowledged that they were indeed his brothers in Christ. 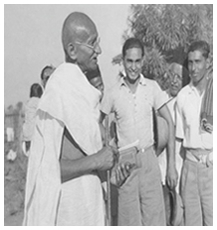 This made him look for possibilities of increasing the financial assistance for a proper home for lepers and thus came into being, the present Leprosy Hospital in Naini, situated across the Jamuna river about 1.5 kilometers south east of the city. The home consisted of a small hospital and church and a home for the untainted children of the lepers. This home was the project of Ethelind Higginbottom, wife of Dr. Sam Higginbottom. She felt that children who were separated within the first year of their birth from their parents would not contact this disease. This home was adjacent to the Naini Jail where the superintendent Col. E. Hudson, introduced improved agricultural techniques on the jail farm. 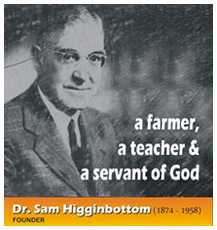 Dr. Higginbottom seized upon Hudson’s methods of farming and taught these methods to the lepers who were able to farm. The evolution of an agricultural school was much more complex. 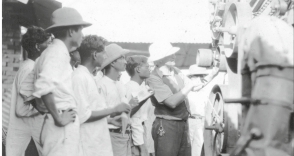 Dr. Sam Higginbottom wished to establish a school that would train young men to work in villages as well as do research in practical agricultural problems of the villagers. His experiences as a teacher, his studies about India and his association with Col. Hudson helped him to develop this school. During his teaching of economics, he observed that the course was rather unrelated to the needs of the Indian students. The books were based on the knowledge of Western, urbanized society, which here was meaningless for the Indian students. The lack of comprehension and the impracticality of the course deeply disturbed Dr. Higginbottom. He then decided to aquaint his students to the Indian economy. Dr. Higginbottom gave his students practical demonstration by taking them to observe the life style of the villagers, personally. He showed the students Col. Hudson’s farm at the Naini Jail, so they would have a first-hand information regarding the possibilities of improved agricultural methods and teaching of practical village industries such as wood carving, pottery, rug making, canning, etc. Dr. Higginbottom, thus planned and started a school which was located in the transJamuna region on the southern bank of the river, directly across the Allahabad Christian College Campus. This region was connected to the city of Allahabad by a two-tiered wooden bridge which spanned across the Jamuna and had a double rail line on the top and a dirt road underneath. About half a kilometer in the south-west direction from this bridge the Agricultural Institute was established in the year 1910. About 120 kilometers down this road was the Estate of Rewa. This region was one of the poorest regions of this area, the soil was of a very poor quality (usar), it was barren and had not been cultivated for years. Dr. Higginbottom took advantage of this opportunity and along with his associates reclaimed the area and demonstrated the potential value of usar and felt that the ryots would be inspired to adopt the practices of the Agricultural School. He had to his advantage the fact that this school was situated on the confluence of the Ganga – Jamuna, (known as “the Sangam”). Every year in the months of January and February, thousands of pilgrims passed this way and thus they would be able to observe and practically see the improved methods of agriculture which were implemented on the farm and in return would carry these ideas with them to the various parts of country from where they had come. The first phase of the Institute was its establishment, development of appropriate training courses and training programmes. Informal classes began in the fall of 1912 and it was during this period from 1912 to 1919 that the Institute faced a time of uncertainty. The dairy, animal husbandry and agriculture farm were developed. Diploma in farm machinery and dairying were started in 1923, then a degree in agriculture in 1932, followed by a degree in agricultural engineering in 1943. This became the pioneer Institute to offer agricultural engineering degree in the whole of Asia; and the fourth in the world. Prof. Mason Vaugh, an agricultural engineer, founded the Department of Agricultural Engineering, and became the father of Agriculture Engineering in India in the early 1940s. Several implements such as Mould Board Ploughs (Wah Wah Plough, U.P. No.1, U.P. No.2, Shabash Plough) hoes, cultivators and wheat thresher were introduced for the first time introduced in India by Prof. Vaugh. The next phase of the Institute was taken up by Dr. A.T. Mosher, in the year 1948–49, and the major expansion such as the construction of the College of Agriculture, New Hostel and many residences took place during this period. The most famous agriculture extension project was “Jamuna Par Punar Yojna”, in which the “Gaon Saathi”, (recruitment of village-level workers) was introduced into the extension system for the first time in India. The first planners of our country took the idea of the ‘Village-Level Worker’ as a community-development model. This has now been adopted by eleven countries of the world. In October 1947, the Institute was brought under an independent Board of Directors, which was sponsored as an ecumenical body by a number of Churches and Christian Missions called The Board of Directors. On the 25th of Aug. 1950, the A.A.I. was registered to function as a Christian Educational Institute of a national stature. 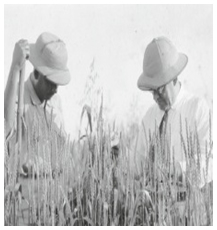 Dr. J.B. Chitamber, a famous extension scientist, took over the reigns of the Institute. Major academic expansion took place during this period, i.e., from 1950 till 1980. Dr. Chitamber who had worked very closely with Dr. A. T. Mosher, led the Institute successfully and made extension a very well-known programme of the Institute. From the year 1980 to 1995 the Institute faced financial and administrative crisis, the worst in its history and suffered the severest bankruptcy, due to which land had to be sold for disbursement of salaries, as employees were not paid for ten to twelve months. All fixed deposits dried out. However, through the prayer of believers and by the grace of the Lord Jesus Christ, as the people started realizing the vision of the founders, the spirit of the Lord once again started working in the Institute and by the end of the year 1996 the Institute survived and came out of this crisis. In order to obtain more academic freedom and to strengthen the specialized programmes of teaching, research and extension a proposal was submitted to the Ministry of Human Resource Development, Govt. of India by the Director Dr. Rajendra B. Lal on the 31st of August 1994, that the Institute be granted the status of a Deemed University. In 1997, a team of experts from ICAR and UGC visited the Institute and gave their recommendation that the Institute be declared as a Deemed University, as it had all the potentials of a university. On the 15th of March 2000, Dr. Murli Manohar Joshi, Hon’ble Minister of Human Resource Development, Govt. of India, gave his approval to the recommendations of the UGC. The Central Government issued the notification No. F-9-26/94-U.3. 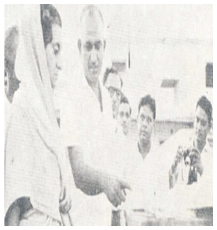 dated the 15th of March 2000, declaring the Allahabad Agricultural Institute-as Deemed University and Most Rev. Prof. Rajendra B. Lal, was appointed as the first Vice-Chancellor of the University. Today, under the dynamic and vibrant leadership of Most Rev. Prof. Rajendra B. Lal, the University has been accredited with “A Grade” by National Assessment and Accreditation Council (an autonomous body of UGC) in 2013. In 2009, Indian Council of Agricultural Research (ICAR) and in 2010, Indian Council for Forest Research Education (ICFRE) also accredited SHUATS. SHUATS is an ISO 9001:2008 certified institution serving the nation for the past 106 years. As a tribute to the founder Dr. Sam Higginbottom, who through his sincere services, hard work and dedication, has contributed greatly towards enhancing the agriculture production in our country, a proposal was submitted to Ministry of Human Resource Development, Govt. of India, New Delhi to rechristen Allahabad Agricultural Institute-Deemed University as “Sam Higginbottom Institute of Agriculture, Technology and Sciences”. In view of the above, Ministry of Human Resource Development, Govt. of India, New Delhi vide communication bearing reference No. F.13-7/2008-U.3.A, dated September 22, 2009 has permitted rechristenng of the Allahabad Agricultural Institute-Deemed University as: “SAM HIGGINBOTTOM INSTITUTE OF AGRICULTURE, TECHNOLOGY & SCIENCES” (Formerly Allahabad Agricultural Institute), (Deemed-tobe-University). To upgrade the Deemed University to a full fledged University under State Act, Hon’ble Vice Chancellor, Most Rev. Prof. Rajendra B. Lal tirelessly worked hard in pursuing the University Act with the State Government from the year 2010. Due to the hard and painstaking efforts of the Hon’ble Vice Chancellor and, after considering the adequate availability of teaching / non-teaching staff and other essential infrastructure facilities in the Sam Higginbottom Institute of Agriculture, Technology & Sciences - Deemed University(SHUATS), Allahabad, the Uttar Pradesh Legislature decided to upgrade, reconstitute and establish SHUATS as a fullfledged University under the State Act so as to ensure successive development of Agricultural Education, Research, Extension, Science, Technology and other disciplines in the State. The Uttar Pradesh Legislature was pleased to pass the Sam Higginbottom University of Agriculture, Technology And Sciences, Uttar Pradesh Act, 2016 (U.P. Act No. 35 of 2016). Hon'ble Governor of Uttar Pradesh has very kindly given his assent to the aforesaid Act on December 27, 2016. Sam Higginbottom University of Agriculture, Technology And Sciences, Uttar Pradesh Act, 2016 has been notified in the official Gazette vide Notification No. 1867/79-V-1-16- 1(ka)36-2016 dated December 27, 2016. Vide Notification No. 2473/67-KSA-2016- 900(2)/2010, dated December 29, 2016, Hon'ble Governor, Uttar Pradesh was pleased to appoint December 29, 2016 as the date on which the aforesaid Act would come into force.